These cute wedding favors will be a huge hit with your guests! Personalize the labels with your text and colors for a simply sweet touch to your special day. If you choose to order the tubes and the stickers, you can use the flavor drop-down to pick from our three popular flavors! If not, choose "I CHOSE LABELS ONLY." *PLEASE NOTE: You MUST order "labels AND balms" to receive both! If you order "LABELS ONLY" and choose a flavor anyway, your flavor choice will be disregarded. The stickers are peel-and-stick with adhesive backing. No glue or tape needed. The tubes are clear and easy to apply the labels to! 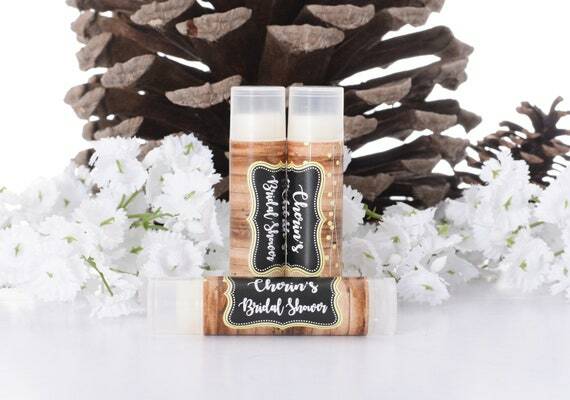 The lip balm is made with a natural formula that has a great scent and taste but DOES NOT have any SPF. ASSEMBLY REQUIRED. Apply the labels by peel and stick. 1. Use the CHOOSE ORDER drop-down menu to select your quantity and order labels only, or tubes & labels. 2. Enter the details for your labels in the PERSONALIZATION box. This will include the text and colors to be printed, along with any extra details. 4. That's it! Your proof will arrive via Etsy Message in approximately 24 business hours. 4. For international orders, please allow 3-6 weeks. LabelsRus has been in business since 1998. We are label professionals who take our job very seriously. Etsy is not a hobby or part time job for us.